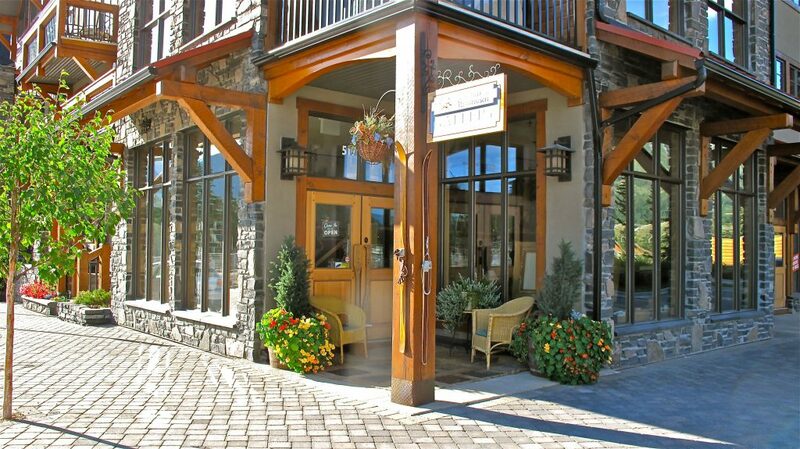 Take a stroll along the creek to Spring Creek Drive to find charming shops, galleries, and services. 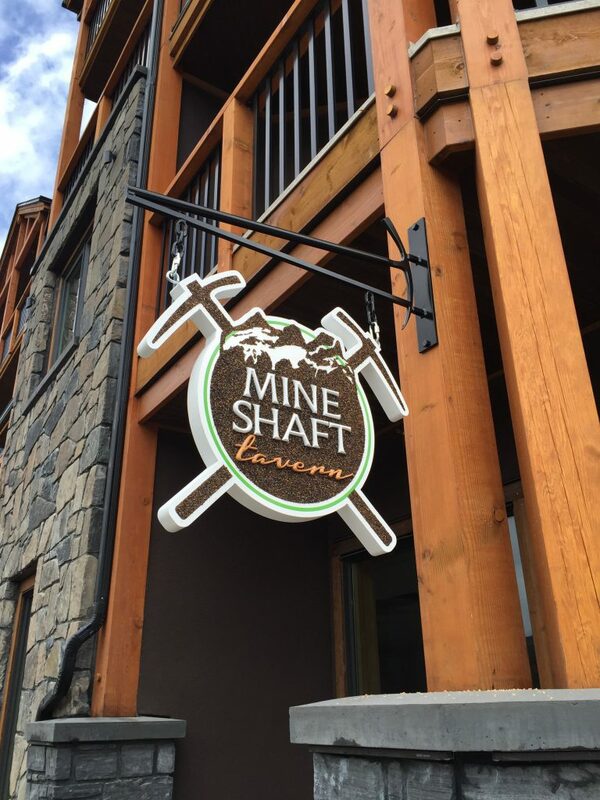 Just a quick stroll off Canmore’s Main St. and you’ll discover charming shops, services, and art galleries. If you’re lucky, you’ll even catch an artist at work. What’s better than settling in at a neighbourhood pub for a pint of beer and a whole lotta cheer with old friends and new acquaintances? It should come as no surprise, then, that Spring Creek would be home to a neighbourhood pub all its own. Located on the street level of Spring Creek’s newly opened +65 Origin at Spring Creek. 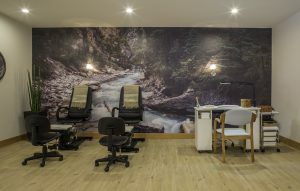 Discover this calm, soothing setting for fitness, relaxation, beauty and nutrition. Relax during a therapeutic massage. Treat yourself, or even better, book a mother-daughter spa day for facials, pedicures, hair colour and make-up application. 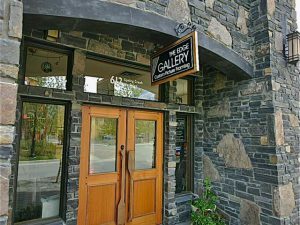 Canmore’s custom picture framing shop, the Edge Gallery is also the studio of David Foxcroft, whose work – which includes collage, sculpture and painting – can be found in private and public collections across Canada and beyond. 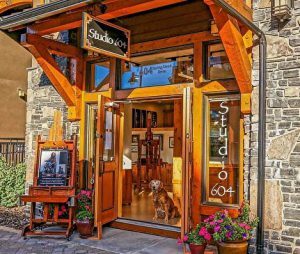 In this working studio, you’ll usually find Pat Sullivan at her easel, painting Rocky Mountain landscapes primarily in acrylics. The gallery showcases her most recent original paintings as well as art cards and limited edition giclées. Virginia’s whimsical paintings, art cards, designer handbags and one-of-a-kind collector’s items feature Rocky Mountain themes and international folk art maps. 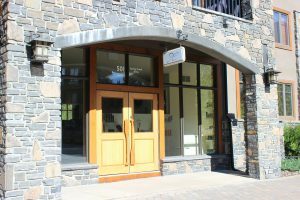 Did you know Stonewaters Home Elements downtown Canmore has a clearance centre just steps away in Spring Creek, offering discontinued showhome and staging furniture. With a large variety of tables, chairs, sofas and beds, their ever-changing stock is UP TO 60% OFF!